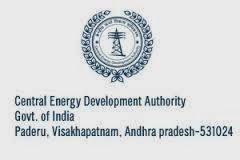 Central Energy Development Authority (CEDA) , Andhra Pradesh invite Online Application from eligible applicants for the post of Administrative Officer , Accountant , Desk Officer & Office Assistant. Eligible Applicants may apply through online mode before 22 January 2014 . Qualification : Applicants Should have completed Graduate Degree from a recognized university . How to Apply: Eligible candidates should go through detail notification and apply Online through official website http://www.cedaindia.net/vacancies on or before 22nd January 2014.